Angier, NC (March 22, 2019) – As BullDog Hose Company celebrates the start of its second year in business, it is setting its sights on making a strong appearance at this year’s Fire Department Instructor’s Conference (FDIC) in Indianapolis, Indiana. 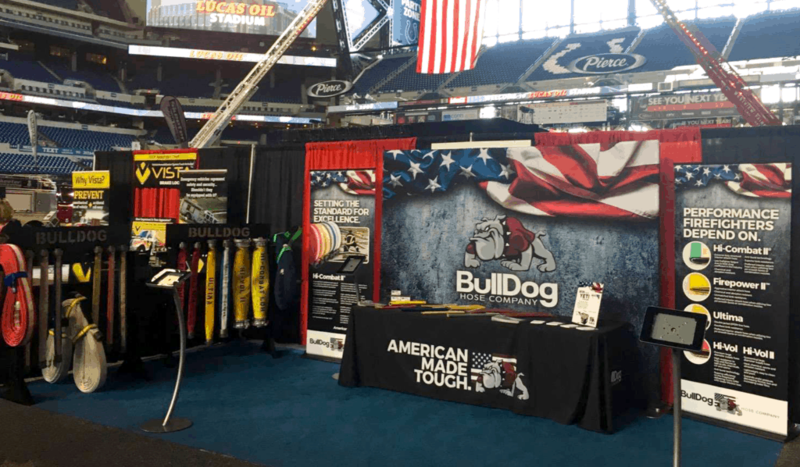 Attendees can find BullDog Hose at booth #9207 in Lucas Oil Stadium from April 11-13. BullDog will be unveiling its new hose product, Fire Guard™, at the event. Fire Guard features anti-kink technology and can be easily attached to a fire department’s attack lines, an industry first. At their booth this year, the company is determined to continue increasing awareness for its “American Made Tough” brand and premium hose products. FDIC attendees can participate in a BullDog giveaway for 10-foot sections of its new Fire Guard hose product. Representatives will also be present to connect with hundreds of fire departments that attend the conference. BullDog has established itself as a preferred supplier of hose throughout North America, and the company has a rich tradition of developing innovative hose products for the fire, military, industrial, municipal, and agricultural industries. The North Carolina based manufacturer is known for its abrasion resistant, protective coating, and anti-kink hose technology. FDIC visitors can get an up-close-and-personal experience with the BullDog hose product lineup and see for themselves how the company is keeping firefighters in mind when manufacturing high-quality fire hose right here in the United States. FDIC represents the world’s largest firefighter conference. Each year, over 34,000 fire industry professionals descend upon the “Crossroads of America” to participate in the conference’s workshops, classes, and hands-on-training evolutions. BullDog Hose Company is one of over 800 companies exhibiting at this global hub for the Fire & Rescue industry. Stay informed by following BullDog Hose Company on Facebook, Twitter, and Instagram.